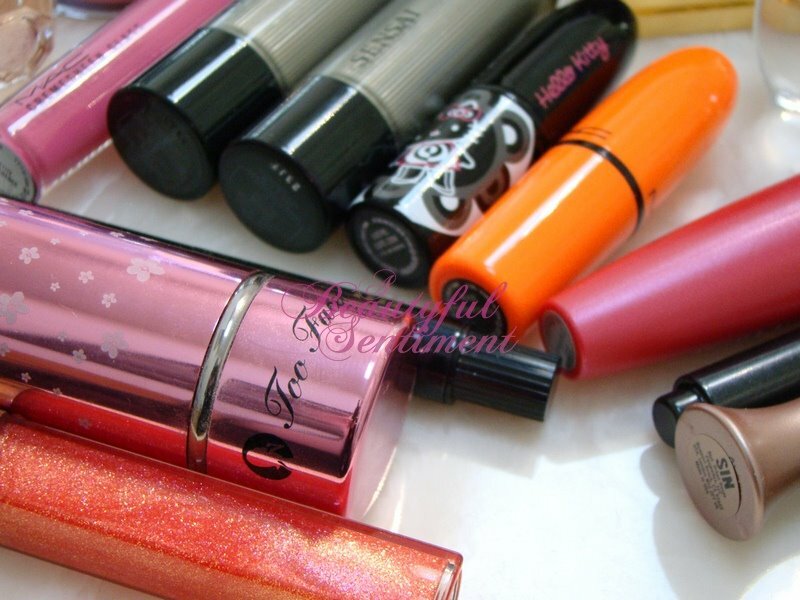 Anniversary Giveaway: What’s In Your Makeup Bag? I know that as a makeup fanatic, I have the toughest time sifting through my collection in order to select those key products that will make it into my makeup bag for that week. Here’s what I’ve been carrying around with me lately, but keep in mind that this changes regularly! Everything crammed into the super cute Hello Kitty for MAC Medium Makeup Bag Nicole got me! 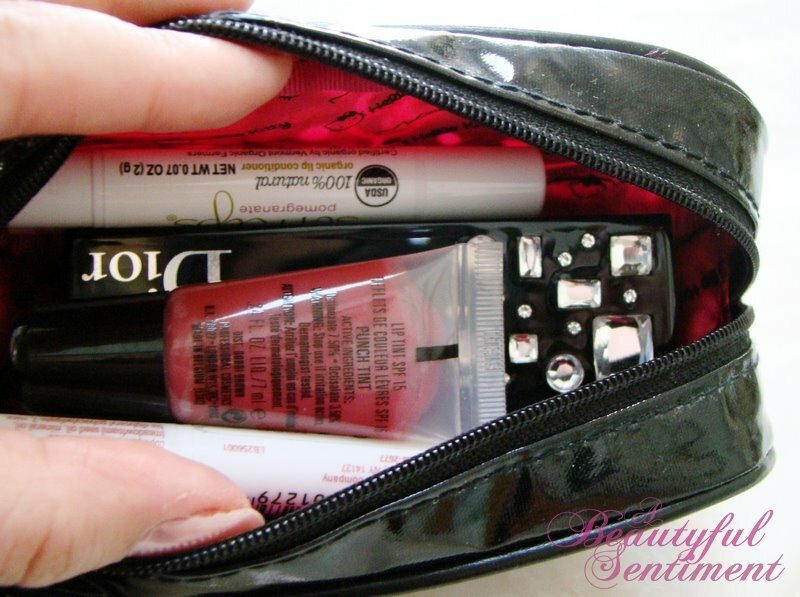 Check out close ups of what’s inside my makeup bag and learn about the giveaway after the jump! So in this photos we have: ROHTO Ice eyedrops (love this stuff and the packaging is great! ), Bare Escentuals Buxom Gloss in Clair (review HERE), Anastasia Eyebrow Pencil in Brunette, Bobbi Brown Face Touch Up Stick in Sand, MAC Fashion Lipglass (from DressCamp), CoverGirl Lashblast Luxe, YSL Ombres Duolumieres in #5 (I have EOTD’s using this around the blog if you search), and the corners of other random products you’ll see below. And More Stuff: The same CG Lashblast Luxe, Kanebo Sensai Liquid Liner (this stuff is AWESOME! ), Urban Decay Primer Potion in Sin, and the Bobbi Brown Face Palette that I filled myself (check out what’s inside HERE). And More: Viktor & Rolf Flowerbomb Mini (thanks Nicole! ), MAC Hello Kitty Tinted Lip Conditioner in Pink Fish, MAC Cremesheen Glass in Petite Indulgence, Kanebo Sensai Deep Moist Shine Rouge in Botan and Lasting Treatment Rouge in Hitoeume, and my beloved La Mer Loose Powder in Translucent. And Even More: Too Faced Retractable Kabuki Brush (review HERE), Chanel Glossimer in Big Bang, MAC Hello Kitty Lipstick in Cute-Ster, MAC Heatherette Lipstick in Pleasureseeker, and the gorgeous Cle de Peau Touche de Rouge Extra Silky Lipstick Nicole got me (review HERE). Almost There: Bobbi Brown Lip Tint in Punch Tint, my Dior Diamonds Lipstick Case with Dior Addict Lipstick in Pink Empress inside, and a bunch of SoftLips. I hope you’ve enjoyed this little journey into the depths of my makeup bags!! 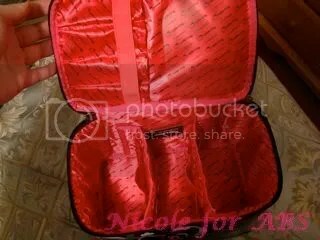 So tell me…what’s inside your makeup bag? In celebration of ABS’ upcoming 1st Birthday (April 11th–yay!!!!!) and all the wonderful readers that I’ve come to know and love during this short period of time, I’ll be hosting a series of fun giveaways throughout the month. Our first one (see it HERE) just came to a close, and here’s Anniversary Giveaway #2! 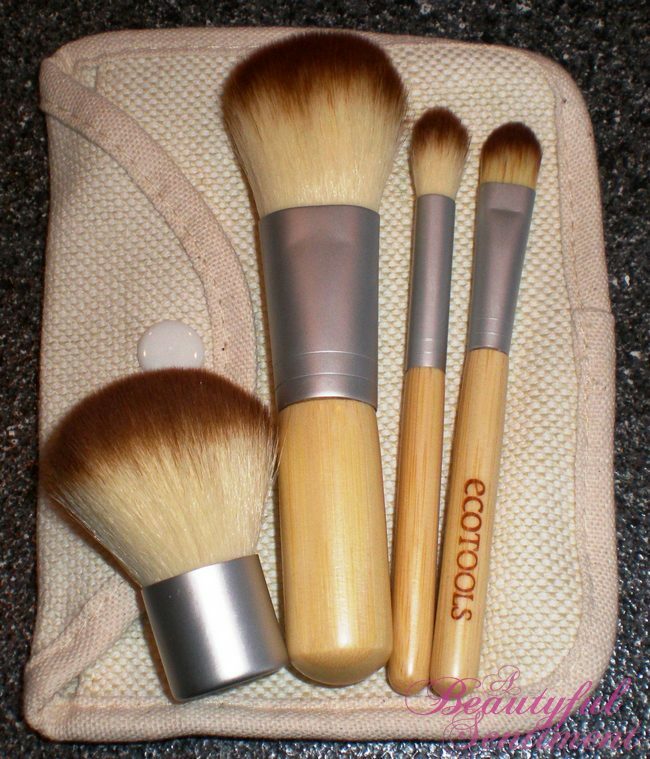 I’ll be giving away TWO sets of ecoTOOLS 5 Piece Mineral Makeup Travel Brush Sets (see my review HERE) this time around. Please be sure to read the rules carefully before entering as this one’s kind of different! 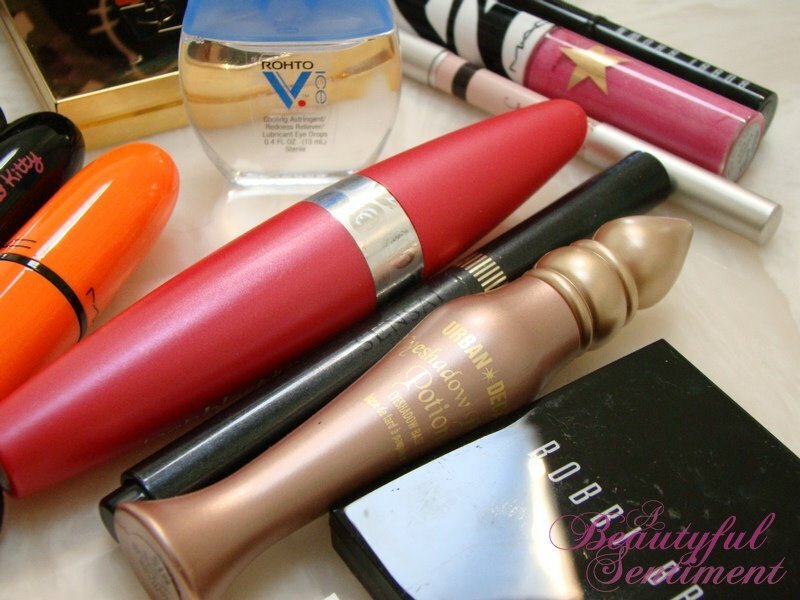 1) Send me an e-mail by midnight April 10, 2009 (EST) with an attached photo showing me the contents of your makeup bag (and keep in mind that these will be posted on the blog unless you notify me otherwise, i.e. telling me that you’re not comfortable with that). One winner will be chosen at random from amongst these entries. 2) Leave me a comment by the same date/time in this post, telling me contents of your current makeup bag. I know some of you don’t have easy access to cameras or you just don’t have the time/inclination to take photos! =D The second winner will be chosen at random from amongst this set of entrants. And yes you can enter both pools by submitting a comment and sending me a photo! PLEASE NOTE: Giveaway open to US residents ONLY! 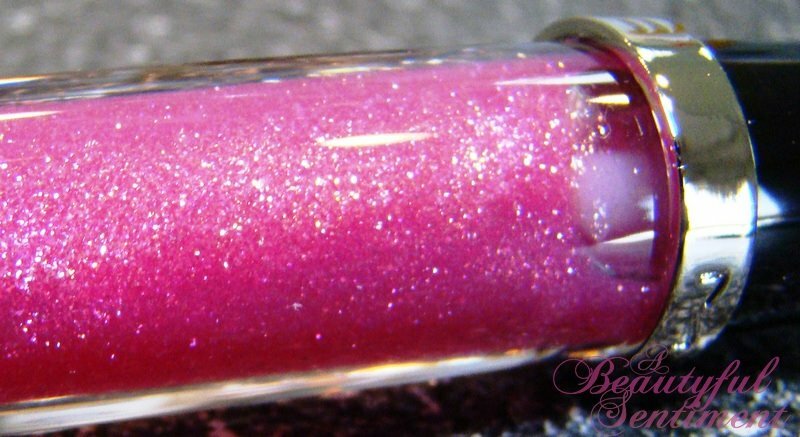 You’ve already seen the review and the lip shots, but I thought it’d be fun to share some up close and personal shots of the MAC Hello Kitty Kouture Dazzleglass in Dazzlepuss–isn’t she gorgeous? I LOVE that they chose to “bejewel” the box – they’re just raised bumps on the box but really cute nonetheless. The collar and charm are removable so that you can transfer them to your other dazzleglasses once this one is empty. I was surprised to see MAC’s Hello Kitty Kouture collection being carried at Nordstrom, as I’d heard that it was going to be at MAC stand-alone stores only, but I’m not one to complain since it saved me a (very long) trip to my nearest MAC store. How amazing is that display? I do so wanted to take it home with me! Unfortunately the two Dazzleglasses are missing as somebody had borrowed them when I got a chance to sneak a photo with my phone camera (which btw is sooo much better than my old phone’s camera, wouldn’t you agree?). 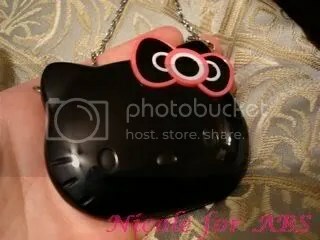 Hello Kitty Sheer Mystery Powder ($90): So I can’t do an in-depth review of this I don’t own it, nor will I ever because I just can’t afford to purchase it right now, and by the time I would be able to it’ll be long gone, but I will share my thoughts based upon my short but sweet meeting with this stunning compact. I actually wasn’t expecting to like this at all, but the compact is so lovely in person ~ it’s got a nice, weighty feel to it, is beautifully constructed, and is seriously cute! As for the powder inside, it was silky smooth, blended beautifully, and light medium would have made a great setting powder for me :(. I want it! Dazzleglass in Kitty Kouture ($28): Kitty Kouture is a barely there shade of pale pale pink that contains red and gold pearl. It’s not so impressive in the tube, but it’s actually quite pretty on. 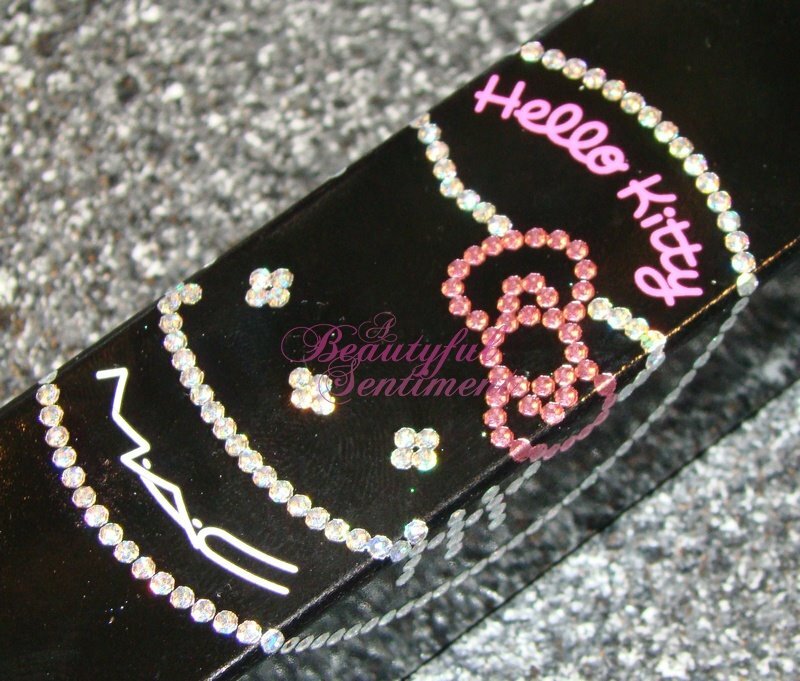 The packaging consists of the normal Dazzleglass tubes, but there’s a metal ring that says MAC on it attaching a cute Swarovski-embellished Hello Kitty charm. And of course the formula is the same thick and sticky but oh so beautiful Dazzleglass formula that some love and others hate. On the lips Kitty Kouture imparts a slightly milky pink that almost looks like a clear gloss on, but the iridescence under bright lighting is gorgeous! 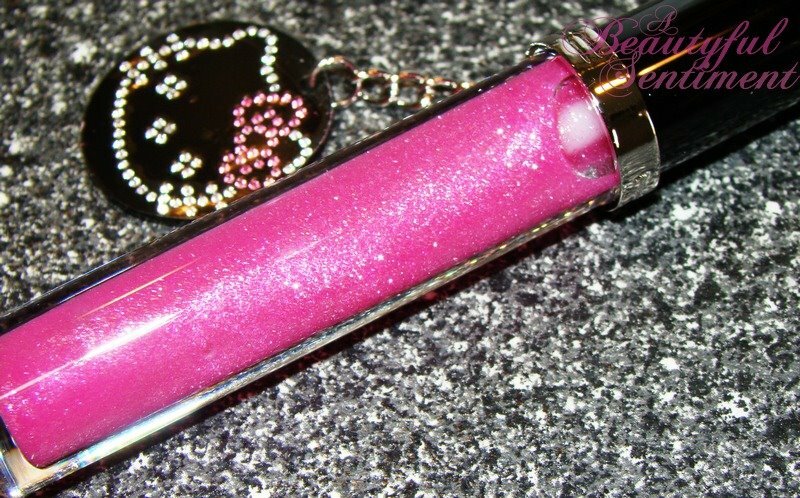 Dazzleglass in Dazzlepuss ($28): Dazzlepuss is a bright pink with red and blue pearl, but don’t be intimidated by how bold it looks in the tube, as Dazzlepuss is really quite sheer and once on gives your lips a barely there kiss of bright pink. 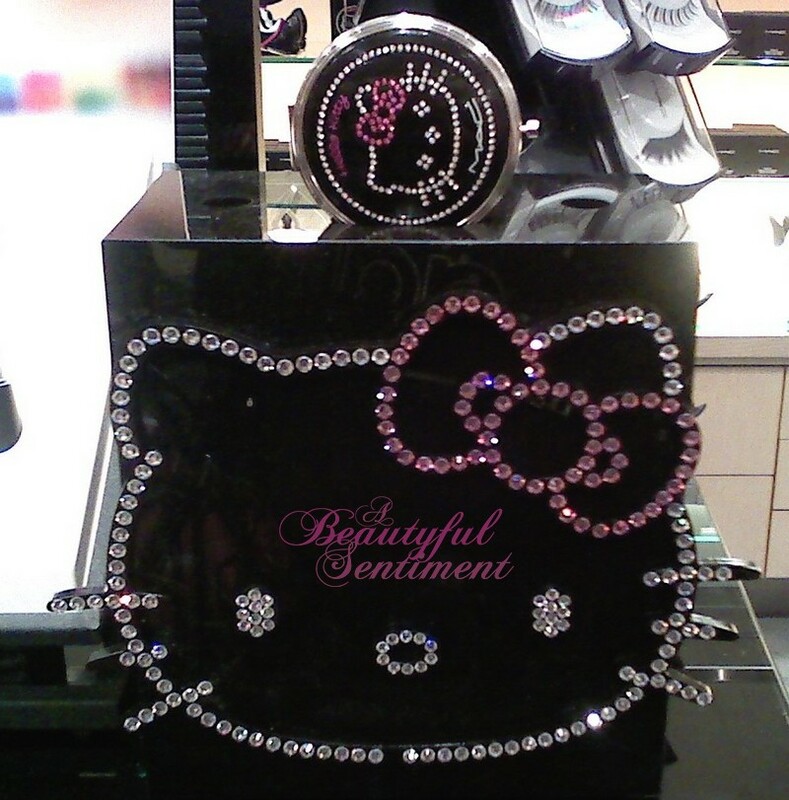 Sadly I really loved everything from MAC’s Hello Kitty Kouture release – if only I could afford it! Tell me what you purchased so that I can live vicariously through you! 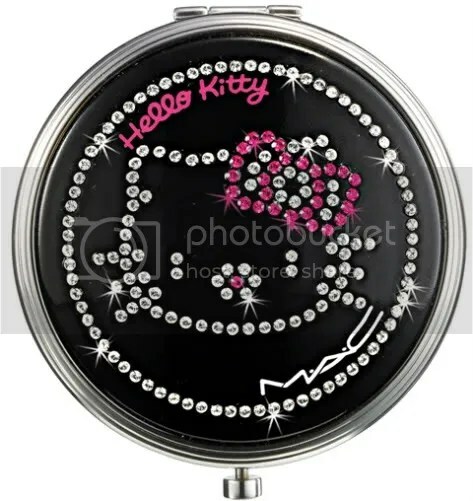 MAC Hello Kitty Kouture Now Online! Luckily there are only five products available, meaning there aren’t too many decisions to be made. I’m seeing a Dazzleglass or two in the works, primarily because the packaging is just so darn cute. What do you foresee in your Kitty Kouture future? Hello Kitty Kouture launches March 5th–will you be indulging? I’m seriously tempted by the Dazzleglasses both because they’re really cute and because I happen to really like Dazzleglasses, but I’m not sure if I should get these. See my next post to find out why I’m hesitating! 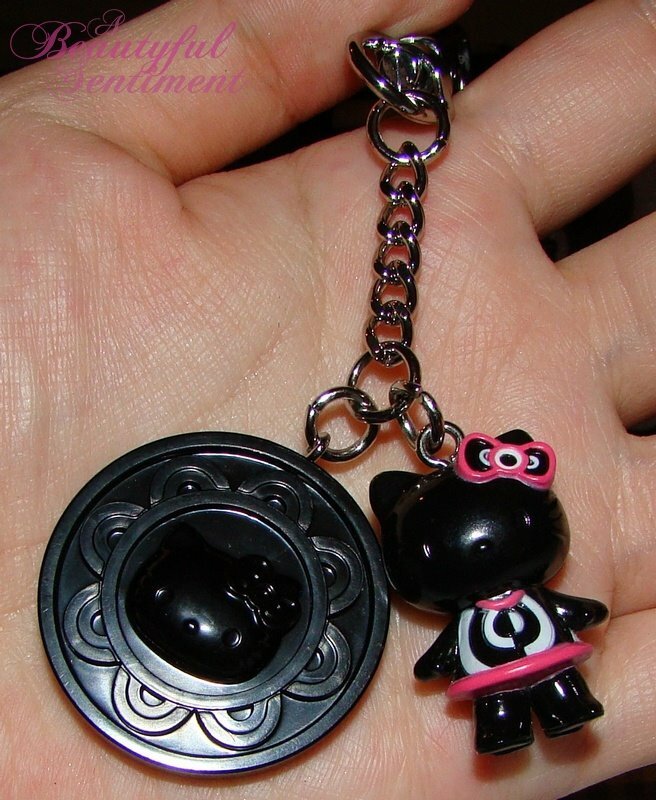 Plus My New Keychain~isn’t she cute? 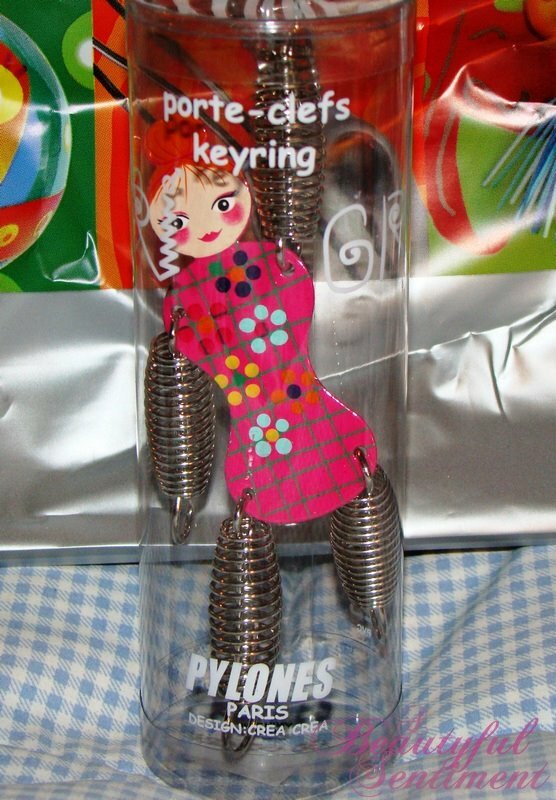 My new keychain from Pylones~~I found this store in Grand Central the other day and I LOVE it! So I’m sure you’ve all heard me go on and on and on about just how fabulous Nicole is–I’ve even had kidnapping threats from a certain somebody *ahem. * But nope she’s mine all mine! When Nicole told me she’d picked up a little something Hello Kitty for me, this oh so generous package was the last thing I was expecting! Scroll down to see what I got! 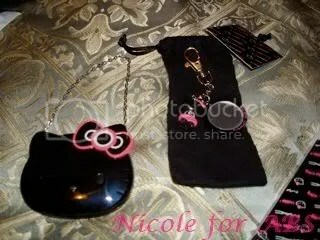 Super-cute mirrored keychain/bag charm I’ve been lusting after since seeing Nicole’s. 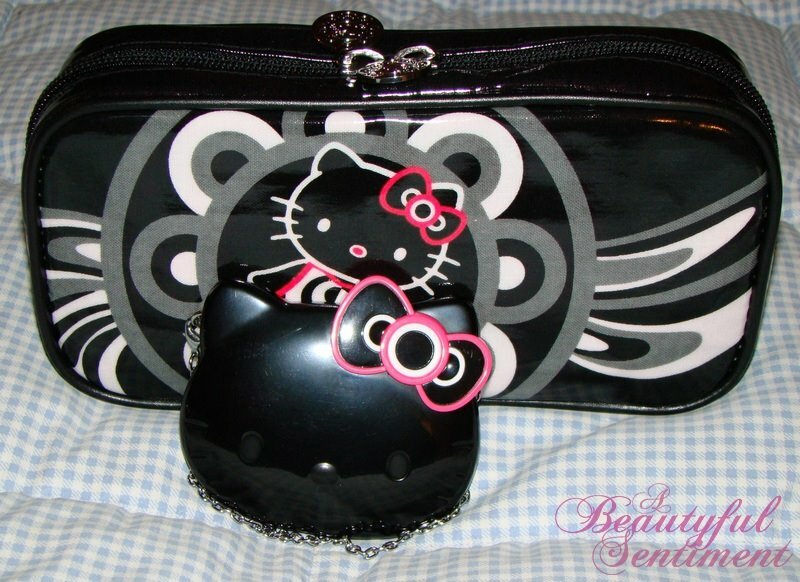 Medium makeup bag (which I couldn’t stop thinking about) and the ridiculously cute purse mirror. 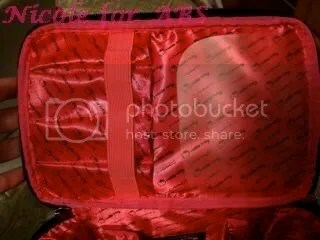 Gotta love the great zippers on the makeup bags! 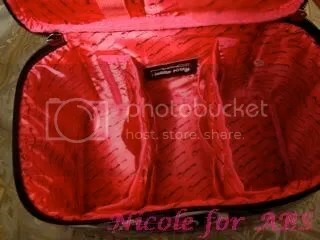 Thank you sososo much Nicole! I finally let myself really play with everything, and I’ve been having so much fun just looking at all my Hello Kitty accessories together! And today was seriously the perfect day for me to decide to let myself indulge in some Kitty, since it seems that whatever I ate for lunch isn’t agreeing with me at all. I won’t go into the gritty details, but suffice it to say that I’m feeling pretty nasty and will be going up to bed as soon as I’ve clicked “publish”! 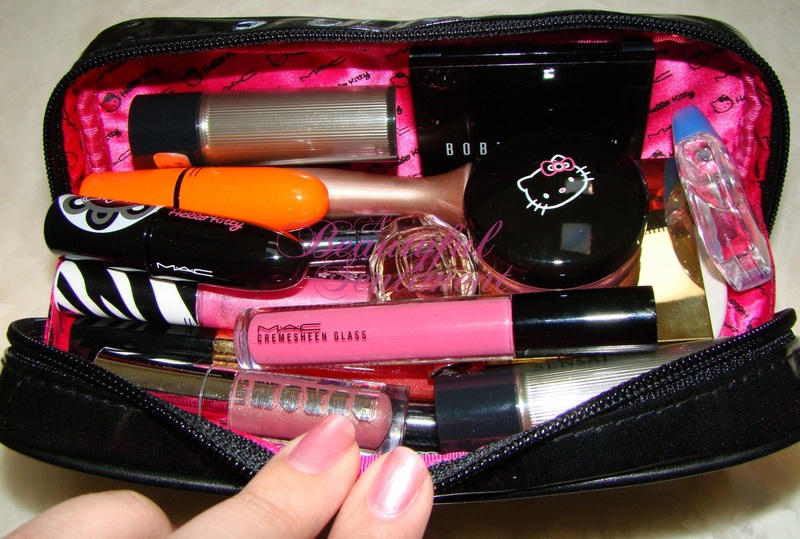 On days like this, it’s always great to have Hello Kitty-themed makeup goodies to take your mind off things. ABS’ Giveaway For The Month Of February: It’s Kitty Time! With all the MAC Hello Kitty frenzy that’s been going on as of late, what kind of blogger would I be if I didn’t give away a piece of the action? 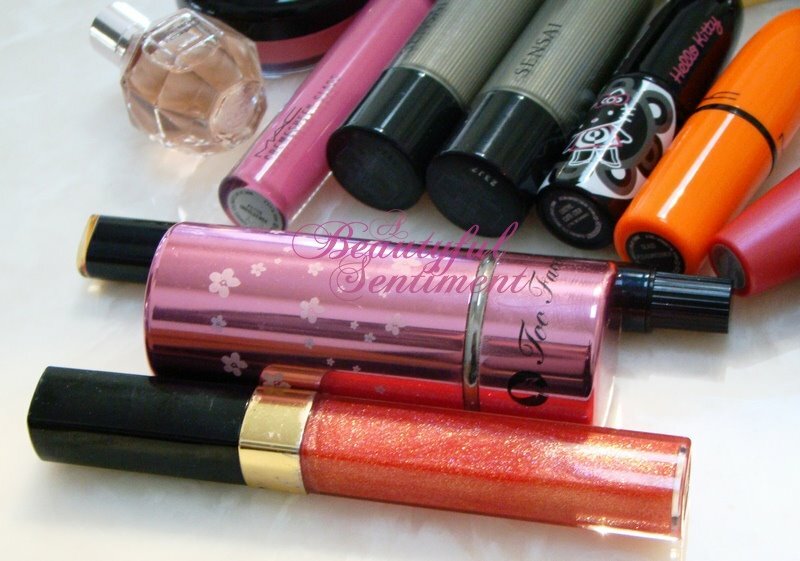 Enter A Beautyful Sentiment‘s February giveaway to win a MAC Hello Kitty lipglass in Nice Kitty, one of my favorite products from this collection! 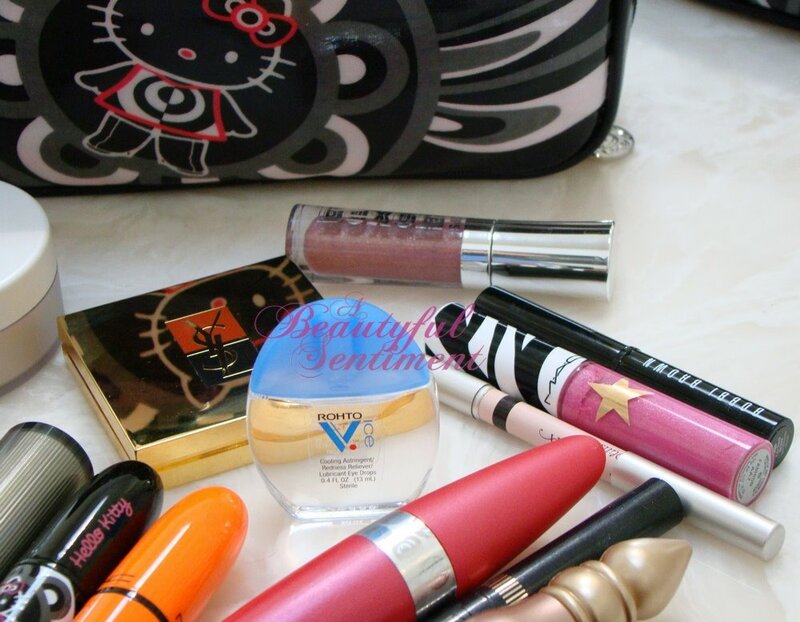 Read over my thoughts on Hello Kitty and check out swatches of the entire collection HERE. 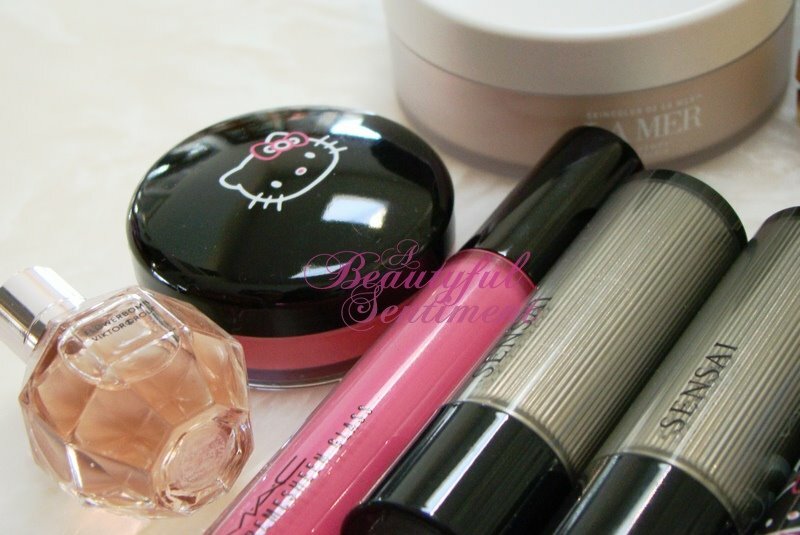 Check out the gorgeous Hello Kitty Tinted Lip Conditioners on my lips HERE. See what the Hello Kitty glosses look like on my lips HERE. 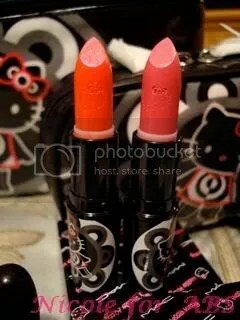 See photos/swatches of the Hello Kitty lipsticks on my lips HERE. Check out my reviews of the Kitty accessories (and more Tippy photos) HERE. 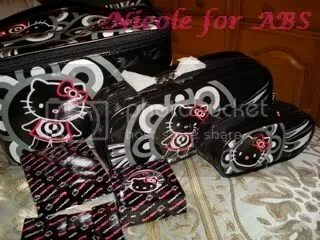 See Nicole’s amazing Hello Kitty Haul including close-up shots of the train case HERE. Check out photos from Bendel’s Hello Kitty launch party HERE. Share Your MAC Hello Kitty Hauls With Me! I’ve been dying to get a better look at some of the Hello Kitty accessories, but thanks to the insanity that’s been my life this week I haven’t been able to find the time–but thanks to Nicole I’ve been inundated with all the cute Hello Kitty for MAC accessory photos that I can handle! I’m so jealous of her fabulous haul! 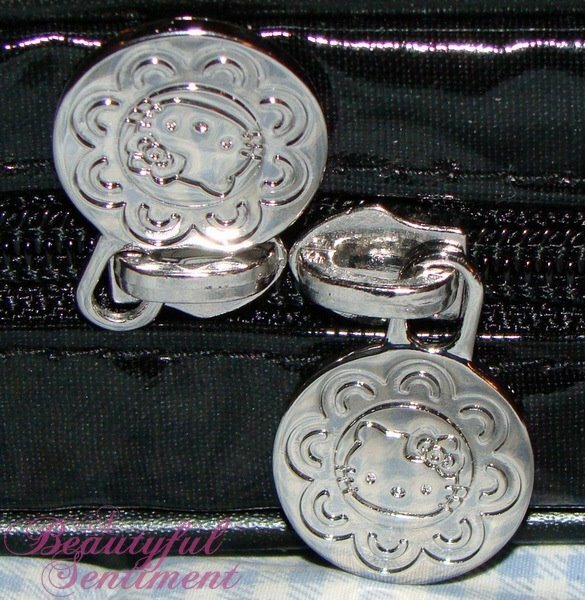 LOVING this Hello Kitty purse mirror–it’s adorable! I didn’t think much of this keychain/mirror thingy when I saw it in the promo images, but I’m seriously wishing I’d picked it up! This train case is TDF! Interior dividers, brush slots, and pink lining–heaven! Sorry I have been as “blog-focused” as I usually am~~things have just been insane at the office this week and while I’ve been thinking of you all constantly, finding the actual time to take photos, upload them, then crop & edit them and compose a post has been more than my exhausted brain can handle. But come this weekend it will once again be all about you my wonderful A Beautyful Sentiment readers!! Hopefully I can have a Valentine’s Day FOTD tutorial up or something! 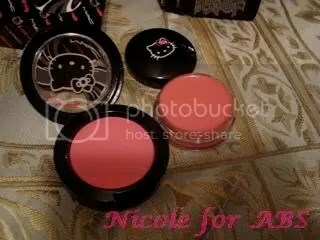 Thanks so much Nicole for sharing your MAC Hello Kitty haul with all of us! Now for the rest of you–what did you end up with? 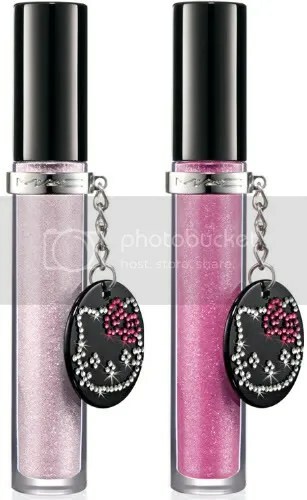 MAC Hello Kitty Now Online! As if you didn’t know! I’m sure many of you have been stalking the MAC site waiting for this to go live, and it’s finally here!! I already hauled all the Hello Kitty that I could afford last week, so check out my swatches and review of the collection HERE . 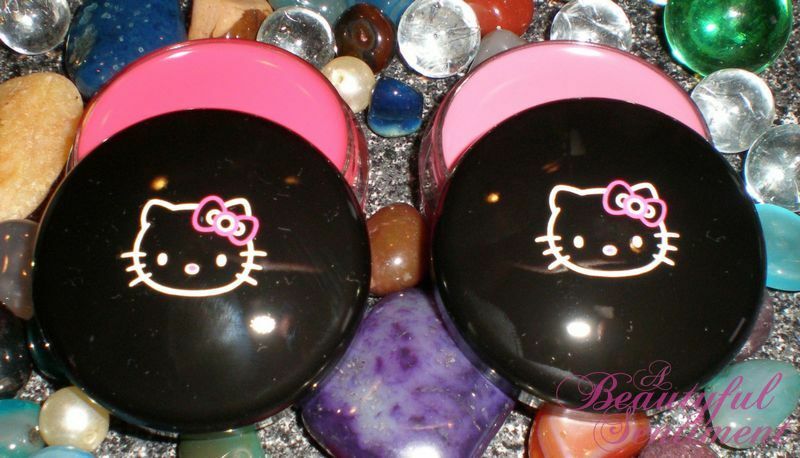 Check out my Hello Kitty reviews and swatches HERE. The packaging on these is so cute! 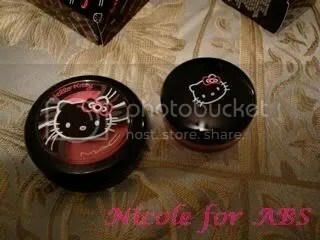 I’ll definitely be taking Deb‘s suggestion and re-using these Hello Kitty printed tubs! While I must admit that MAC’s Hello Kitty collection has turned out to be quite the stunner, for me the stand-out items have been the tinted lip conditioners–they’re both very beautiful and amongst the most pigmented products in the entire collection. I’ll skip the color descriptions since you can check them out (along with reviews and swatches of all of Hello Kitty) in THIS POST but suffice it to say that you should definitely check these out!